The Theresienstadt Requiem - LEDA spol. s r.o. The summer of 1944 was turbulent. Panic-stricken German armies were retreating in disarray on all fronts. German towns and cities were reduced to heaps of bizarre ruins. And Hitler, piqued into unconcealed frenzy by the attempt on his life, sowed death in the ranks of the Wehrmacht. The Nazi Reich was shaken to its very foundations. None of this caused Eichmann to waver in his plans. In Central Europe his tactics for the “Final Solution of the Jewish Question” remained unaltered. And the main item of deception in his plans of window-dressing was to be the huge “Theresienstadt Ghetto” transit camp in Bohemia, hitherto a place of misery, hunger and death, which was repainted in the brief space of a few weeks and decked out as a gigantic, astounding film set, to fool the international Red Cross and to amuse the SS-top brass. In accordance with Eichmann’s screenplay, live people formed part of that film set. In the final act of parody and deception, the prisoners were to perform the monumental oratorium, theVerdi´s Requiem. And they were taken in by it, and began to hope and to live. 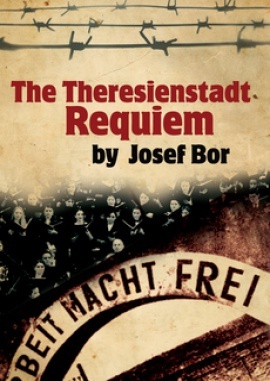 Josef Bor’s dramatic narrative of preparations and rehearsals for the performance of Verdi’s Requiem by Jewish prisoners is a remarkable literary achievement. It has all the raw elements of non fiction told by an observant witness, but when transcended by art, the true story becomes a heart-rending psychological drama.